The Perry Initiative is designed to inspire young women to pursue STEM careers in medicine and engineering - two fields where women make up a small fraction of the workforce. Photos courtesy of The Perry Initiative. 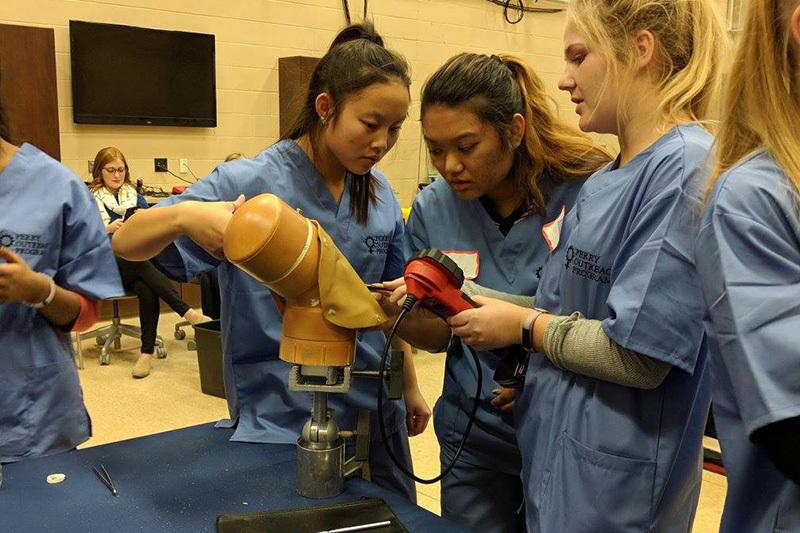 Omaha – A recent event hosted by the University of Nebraska at Omaha (UNO) and University of Nebraska Medical Center (UNMC) inspired young women to pursue a career in one of the most male-dominated medical fields in the country. On Saturday, Nov. 18, faculty from UNO and UNMC brought 40 high school girls from around the region to UNO's Biomechanics Research Building to participate in the Perry Outreach Program, an all-day experience where participants learned hands-on medical techniques and engineering skills through performing mock surgeries. According to the Association of American Medical Colleges just five percent of the more than 19,000 orthopedic surgeons in the country are female. In fact, half of the 10 most disproportionate gender distributions in medicine between men and women are in some sort of surgical field. Additionally, women make up just 13 percent of those with bachelor’s degrees in mechanical engineering and only 20 percent of engineering degrees earned in the United States overall. The Perry Outreach Program is part of the Perry Initiative, a national effort founded in 2009 in honor of Dr. Jacquelin Perry, one of the first female orthopedic surgeons in the country. Dr. Susan Scherl, professor of orthopedic surgery at UNMC and an orthopedic surgeon at Nebraska Medicine and Children’s Hospital and Medical Center, has led the Perry Initiative workshops at UNMC over the last three years. 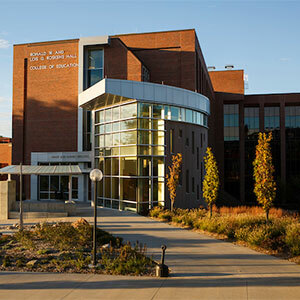 This is the first year the event was hosted by UNO. The event, which is free to participate in for students, featured surgical modules broken up into morning and afternoon sessions prefaced by presentations made by Lanier and Scherl. 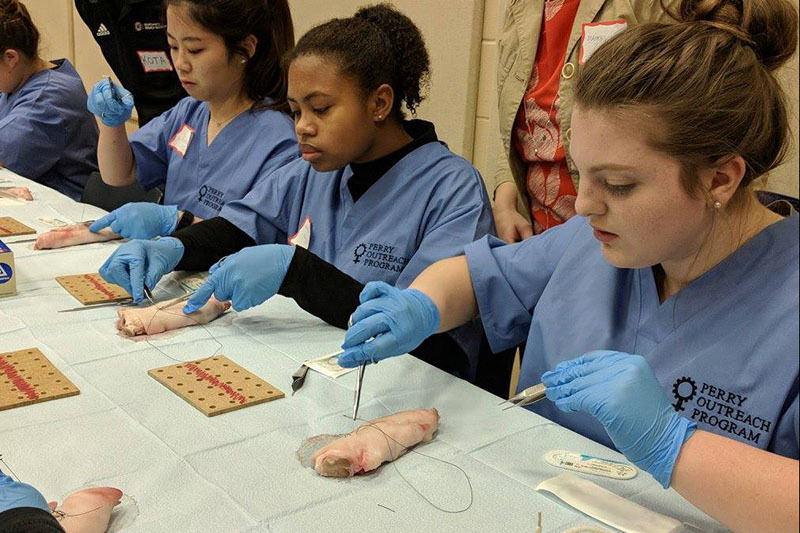 Students had the opportunity to do everything from learning to suture using pigs’ feet or performing a knee arthroscopy on replicas of human bones. As part of the event, participants received their own scrubs to wear and take home, as well as a certificate of completion. Biomechanics professors and graduate students from UNO, as well as volunteer clinicians from UNMC, also helped guide the participants through their surgeries.